Apple Festivals in 2019: Where, When and More to Find an Apple Festival Near You! Looking for a Apple festival in April 2019? There is no other listing as complete and current as this list, just updated! Apple festivals are held through the United States, AppleFestivals-Canada.php, Britain, and Australia and much of the world. All the Apple festivals we can find are listed on this page! If you love apples, look for a festival near you below! And I'm looking for more Apple festivals! Please write me, if you know of any to add! I update the dates as soon as the festivals publish their information, but you can always click on the links (usually the name of the festival) to see the current information on the festival's own website. Always click on the links (the blue, underlined name of the each festival) to confirm this year's dates on the website for each festival. If they don't have a website, call the phone number provided, but ALWAYS CONFIRM THIS YEAR'S DATES AND TIMES BY EITHER VIEWING THEIR WEBSITE OR CALLING. and our guide to apple varieties! For an excellent article about apple cider from Mother Earth News, click here. Lincoln, AR. Since 1975, the Arkansas Apple Festival brings arts and crafts, fair food, kids activities and apples galore to the Northwest Arkansas Region every October. Just 20 miles down the scenic drive of Hwy 62 from Fayetteville, Arkansas this festival combines down home southern goodness with fresh harvest apples to give attendees just a glimpse of what life was like in the Apple Capital of Arkansas many years ago. Whether you come for the free apples slices, the great fair like and food truck goodies, or to buy your year supply of that favorite jelly sold on the square by the attending crafter, the Arkansas Apple Festival will not disappoint. Click here for our Facebook page. Downtown, Bridgeville, DE 19933. Phone: 302-337-7135. Open: Second full weekend in October; Friday, 4pm to 10:30pm; Saturday, 7am to 10:30pm. Directions: Click here for a map and directions. Payment: Cash, Debit cards, Visa/MasterCard. Click here for our Facebook page. Ellijay, GA. The Ellijay Lions Club, the Gilmer County Chamber of Commerce, and the cities of Ellijay and East Ellijay invite everyone to come and enjoy the 34th year of the Georgia Apple Festival. There are over 300 vendors with handmade, hand-crafted items, as well as many on-site demonstrations of how selected types of crafts are made. This year promises many new crafts as well as favorites from past festivals. There is a parade and antique car show each year. The parade is on the second Saturday. 32th Annual Georgia Apple Festival From the mountains of North Georgia . Producing 600,000 bushels of apples each fall, Ellijay/Gilmer County is Georgia's Apple Capital, so it's only natural that the second and third weekends of October each year, people from all over the nation come to Ellijay to celebrate the apple. Handmade arts and crafts, homegrown entertainment, and plain old fun, combine with every apple product imaginable to make the weekends a family adventure. Throw in the colorful fall leaves, crisp mountain air, sky-blue days, and star-studded nights and you'll want to visit again and again. Sponsored by the Gilmer County Chamber of Commerce and the Ellijay Lions Club, the festivities include a car show and a parade. Call the Gilmer County Chamber of Commerce office for more information (706) 635-7400 - www.georgiaapplefestival.org . Also see ELLIJAY CELEBRATES 34 FUN-FILLED YEARS! Apple Pickin' Jubilee at Hillcrest Orchards - September weekends - see their website! 9696 Hwy. 52 E., Ellijay, Georgia 30536. Phone: 706-273-3838. Fax 706-273-3888. Email: [email protected]. 9:00 to 6:00 all four days. Admission: $12.00 per person. Pick your own apples, wagon rides, playground, pig races, moonshine museum, entertainment, food, corn maze, petting farm and pony rides. They also have a "festival" on October weekends with the same activities as Apple Pickin' Jubilee except no apple picking, and the admission is $12.00 per person to that one. Liberty, KY Casey County Apple Festival. The Festival features some 200 vendors displaying Arts & Crafts, Food & Flea Market Booths, plus various pageants & Car Show! A visitor writes on August 10, 2013: "Great - local people." Monmouth Museum, Main Street, Monmouth, ME. Email: [email protected]. he Apple Fest serves as the Museum's end of season fund raising event and brings the community together for a day full of fun and interesting activities for adults and children. Thanks to kind donations of homemade apple pies from Monmouth's great cooks, Apple Fest is the Museum's way of celebrating the apple for which Monmouth orchards are famous. The Apple Fest also exposes people to a variety of apple related activities such as cider pressing, apple arts and crafts, stenciling, displays of apple varieties, and historic artifacts associated with the harvesting and processing of apples. 18-24 Main Street, Cornish, ME 04020. Phone: 207-625-4993. Each year, this FREE festival is held from 9:00 a.m. to 4:00 p.m. in the center of Cornish village in historic Thompson Park and features more than this season's apples, freshly pressed cider and other apple products from local vendors. This event features: Over 50 vendors offering jewelry and crafts. Church & Housatonic Streets will be CLOSED TO PARKING from 12am Saturday until 5pm Sunday. Through traffic is closed on these streets from 9am-5pm both Saturday & Sunday. B.U.T.I. Tanglewood, Shakespeare & Company, & Morris Elementary will have parking for visitors to the event. Leominster, MA. The Johnny Appleseed Festival began in 1994 and today, the event has two days of celebration, including the Johnny Appleseed 5K Road Race, and the Johnny Appleseed Parade. Johnny Appleseed is celebrated by the city of his birth. 14421 90th Avenue South, Afton, MN. Phone: 651-436-8385. Directions: From Saint Paul: I94 east to Manning Ave South. Right on Manning 9 miles to 90th St. Turn left on 90th. Go 2 1/2 miles to Afton Apple Orchard on right. Follow signs. 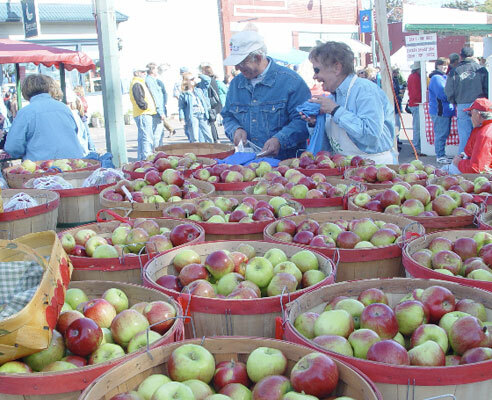 The apple festival is held on the 2nd and 3rd weekends in October at Afton Apple Orchard in Washington County. We have hayrides, large playground, petting farm, straw mountain, concessions, cider pressing demonstrations, face painting and plenty of other apple time favorites. 10am to 6pm Saturdays and Sundays. Call 651-436-8385 for more information. La Crescent, Michigan. Email: [email protected]. Downtown Kimmswick, MO in Jefferson County. The Apple Butter Festival is estimated to draw near 100,000 people. The Apple Butter Festival is FREE, $5+ for parking. Paid parking will be available off of Highway K with just a short walk into town. Visitors may park at Windsor School campus and ride a free shuttle bus into the Festival. The busses will run throughout the day shuttling visitors to/from the parking area at the School. There will be hundred's of vendor booths throughout the city park selling a variety of crafts and food items. Live entertainment will also be provided by the City of Kimmswick and the Kimmswick Merchants.The Apple Butter Festival started in 1977 and has been growing larger and larger each year ever since. All of the town shops are open and accessible only via foot traffic. Don't forget to buy some of the famous apple butter made fresh during the festival by the Kimmswick Historical Society at the Apple Butter Pavilion on Market Street. From past experience, we have found that the best time to arrive at the Apple Butter Festival is between 10am and 11am on Sunday morning due to the fact that many people are in church. To reserve a booth for this years Apple Butter Festival, call (636) 464-7407. Nebraska City, Nebraska. Ranked one of the Top 10 Fall Festivals in North America by the Society of American Travel Writers, Nebraska City's apple harvest celebration is fun for the whole family. Take part in the festivities all weekend long with a parade, a car show, the AppleJack Fun Run/Walk, AppleJam Fest, and an array of craft shows. Then head out to Arbor Day Farm, Kimmel Orchard, and Union Orchard to pick your own apples and stock up on all of the tasty apple treats! The mother of all fruit-based festivities and ranked in the top 10 of fall festivals by the Society of American Travel Writers. Perfect for hipsters and hip replacement candidates alike, this is the festival most folks think of when they think "Nebraska City." Fun for the whole family, including grouchy Aunt Edith. Sullivan Farm Charity Apple Fest - Sunday, October 12, 2008 from 10:00am to 4:00pm. 70 Coburn Avenue, Nashua, NH 03063. Phone: 603-595-4560. Directions: Exit 6 Broad Street, also know as Route 130 West to Coburn Avenue. Click here for a map and directions. Crops are usually available in October. Payment: Cash, Visa/MasterCard. Apple pie contest, hay rides, face painting, pumpkin decorating, scarecrow making, food & refreshments, musical entertainment, fire truck demonstration and much more!!!. apples, produce for sale, parking provide free, snacks and refreshment stand, musical entertainment, cooking or fruit/veg judging, restrooms, face painting. Chester Harvest Festival - Saturday in mid October - See their website for details! Chester, Morris County, NJ. You couldn't pick a better way to spend a weekend! Come and enjoy this FREE 2-day event in Historic Downtown Chester. Peaceful Valley Orchards Fall Harvest Festival - Saturday in mid October, from 9 am to 5 pm. 150 Pittstown Road, Pittstown, NJ 08867. Phone: (908)730-7748. Please join us in celebrating our second annual Fall Harvest Festival and Pig Roast. Most of the festivities will be held at our "New Farm " at 150 Pittstown Road. Come enjoy a hayride to our Pick Your Own Pumpkin field, go through our corn maze or feed our farm animals! We will also have live music performed by The Great Meadows Band. When you're done picking pumpkins drive down the road to our original farm to Pick Your Own Apples. We offer over 10 varieties to choose from. We hope to see you at the farm this October! South Carolina Apple Festival - 5 days in early September, Annually starts the week after Labor Day through the next weekend. Westminster, SC 29693. Phone: (864) 647-7223. Email: [email protected]. Celebrates the beginning of apple harvest season in Oconee County, the largest apple-producing area in the state. The annual festival is held in Westminster, since 1961. Whether you enjoy whitewater rafting, shopping for arts and crafts, browsing antique shops, attending a world championship rodeo or just kicking back and listening to live musical entertainment, the Apple Festival offers something for everyone in the family. Most of the events are free and are planned with the entire family in mind. Also see: Media Resources, 2005 Schedule of Events, Entertainment Schedule, and Scenes from the 2004 Festival. Unicoi County Apple Festival - Friday and Saturday, in early October, from 8:00 am to 8:00 p.m.
100 South Main Avenue, P.O. Box 713, Erwin, Tennessee 37650. Phone: (423) 743-3000. Fax (423) 743-0942. Email: [email protected]. Unicoi County Chamber of Commerce. 2005 is the 28th year of the event. Over three hundred vendors lining the streets drawing an estimated attendance of 90,000. Medina, TX. Event dates: Apple Fest . Map and directions. Click here for a printable PDF version of the schedule of events. FAQs. Bayfield, WI. 44th Annual Bayfield Apple Festival. Join us this Fall in Bayfield! Franklin, Tamar Valley, Tasmania, Australia. Heritage themes, traditional music and local culture. Historical! Schlosspark, Laubach, Germany. Located near Frankfurt / Main, Germany, The Annual Blues and Apple Festival of Laubach attracts about 20,000 visitors a year and combines Blues Music and an Apple Festival. Tel. 0 6405 - 921 - 321. Fax 0 6405 - 921 - 352. Guerrero, Mexico. There's very little information available online about this festival. Does anyone have more details?